Chuck Grassley, chairman of the Senate Judiciary Committee, has launched a new investigation of former Secretary of State Hillary Clinton’s effort to thwart a Bangladesh government corruption probe of Muhammad Yunus, a Clinton Foundation donor and close friend of the Clintons. 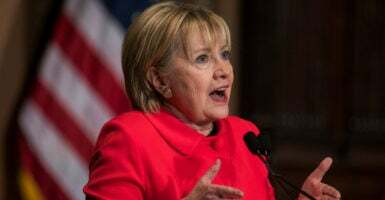 The Iowa Republican’s effort is the first new official inquiry of Clinton since her unexpected loss in the 2016 presidential election to Donald Trump. Trump’s supporters often chanted “lock her up” during his many boisterous campaign rallies. But upon assuming the presidency, Trump and leaders of the Republican-majority Congress displayed little appetite for reopening investigations of Clinton’s tenure as the chief U.S. diplomat and allegations of “pay-to-play” corruption involving the Clinton Foundation. Until now. The Daily Caller News Foundation Investigative Group exclusively reported in April that Clinton sent top U.S. diplomats to pressure Bangladesh Prime Minister Sheik Hasina and her son Sajeeb Wazed in an effort to kill the corruption investigation of Yunus and the Grameen Bank. Yunus was then the managing director of the state-owned Bangladesh bank. In a June 1 letter to Secretary of State Rex Tillerson, Grassley repeated the charge that Clinton threatened Wazed with an IRS tax audit if his mother did not back away from the corruption probe. Wazed has lived in the U.S. for 17 years. “If the Secretary of State used her position to intervene in an independent investigation by a sovereign government simply because of a personal and financial relationship stemming from the Clinton Foundation rather than the legitimate foreign policy interests of the United States, then that would be unacceptable,” Grassley told Tillerson. “Co-mingling her official position as Secretary of State with her family foundation would be similarly inappropriate. It is vital to determine whether the State Department had any role in the threat of an IRS audit against the son of the Prime Minister in retaliation for this investigation,” Grassley continued. Grassley described how U.S. Ambassadors James Moriarty and Dan Mozena, as well as Jon Danilowicz, the deputy chief of mission, met with Wazed in the U.S. Embassy in Dhaka, Bangladesh’s capital, on numerous occasions while the corruption investigation was underway. All three are career diplomats. Another official, U.S. Agency for International Development Administrator Rajiv Shah, also met with Wazed. Shah’s agency awarded $13 million to Yunus organizations and another $11 million to allied Yunus organizations during Clinton’s tenure. The Department of State oversees USAID programs. Clinton’s aid to Yunus included 18 grants, contracts, and loans awarded to two of his America-based foundations, the Grameen Foundation USA and Grameen America, according to USAspending.gov. Yunus was stripped of his directorship of the state-owned Grameen Bank in 2011 as a result of the Bangladesh government’s review of his financial mismanagement of the bank and its “microcredit” loan program for poor peasants, mainly women. A Norwegian documentary charging Yunus personally diverted $100 million intended for Grameen Bank and the poor to his other organizations triggered the initial investigation against him. The pocketing of funds shocked many in poverty-stricken Bangladesh where the annual per capita income is about $3,600, according to the World Bank. Yunus eventually returned the money to Grameen Bank, but the government’s investigation exposed serious financial mismanagement and found the microloan program failed to lift recipients out of poverty. He was forced to resign under a law making 60 the maximum age for the bank’s top position. Yunus was 70 at the time. Interest rates and payback amounts of the microloans sometimes resulted in more poverty, not less. Rather than repaying the loans, a number of recipients in Bangladesh and India committed suicide. Clinton’s support for Yunus dates to former President Bill Clinton’s years as Arkansas’ governor. Both Clintons became microcredit loan advocates and enthusiastic backers of Yunus, who invented the lending scheme. Bill Clinton reportedly lobbied the Nobel Prize Committee on behalf of Yunus. The committee awarded him the 2006 Nobel Peace Prize. From 2008 onward, Yunus was a featured speaker at the glitzy Clinton Global Initiative’s annual meeting. He donated between $100,000-$250,000 to the initiative and $25,000-$50,000 to the Clinton Foundation, according to the Clinton Foundation website. Wazed said it was “astounding and mind boggling” to him that between 2010 and 2012 senior State Department officials repeatedly pressured him to influence his mother to drop the Grameen Bank investigation. The World Bank also unexpectedly decided during Clinton’s tenure in 2012 to rescind a $1.2 billion loan to Bangladesh while the IRS was pressuring Wazed. The funds were sought to build a key bridge near Dhaka. In 2016, Grassley complained about the Clinton Foundation to former Attorney General Loretta Lynch and to the FBI regarding public corruption charges. However, this is the first time since Trump took office that Grassley renewed an investigation into Clinton, this time for her retaliatory actions against Bangladesh on behalf of Yunus. Grassley requested that Tillerson provide the judicial panel with all related emails and State Department records or communications by June 15. The senator also asked if the matter had been referred to the Department of Justice or the State Department’s inspector general. “If not, why not?” Grassley asked Tillerson.